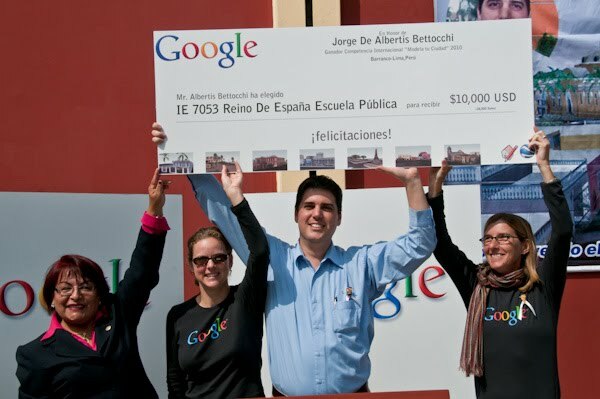 Recently, a team of Googlers traveled to Peru and celebrated the winner (and community) of the Google International Model Your Town Competition. Jorge De Albertis of Lima won through a process where people all over the world voted for one of five finalists. His ability to win so many votes was a testament to the power of a community coming together to support Jorge’s efforts. His contribution creating 3D models of many of the historical buildings in the Barranco District of Lima has garnered a lot of attention in his country, and worldwide. 1. As part of the winning prize, Google gave a donation to a public school of Jorge’s choice. Jorge talked to the students and staff at a ceremony in the school’s courtyard, and we presented a large check to IE 7053 Reino De Espana Public School. Googlers helped students with a hands-on paper 3D modeling project, where they constructed models of the buildings Jorge submitted for the competition. The school graciously hosted a celebration for Jorge and Google, which included a welcome by student marching bands, traditional Peruvian dances, ballerinas, theater acts, singing, and a poetry jam. Click here to see more photos from the events. 2. Jorge and Google hosted a series of tech talks to over 80 design and architecture students and faculty at the University of Lima, explaining how others can get involved with modeling their communities. Demos were presented on Jorge’s project, SketchUp, Map Maker, and Building Maker. Watch a video of an interview of Jorge at the University of Lima. 3. 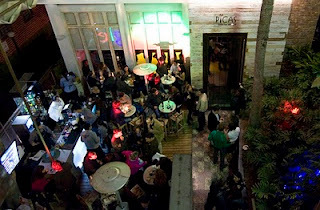 The Latin America International Film Festival had a looping video of Jorge’s work running throughout the week. 4. 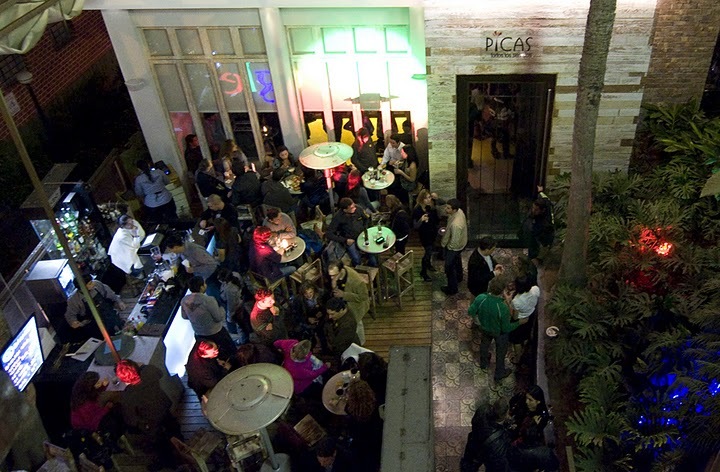 Google held a celebration in Jorge’s honor at Picas, which was attended by designers, architects, educators, tourism officials, and the general Lima community. The fun-filled event had demo stations where people could learn more about Google Earth, Map Maker, Building Maker, and Google SketchUp. The band, Colectivo Circo played to a packed house. Jorge received a plaque and spoke to the community about his efforts. We are thrilled to have visited Jorge and to have met many people in the Lima community. Congratulations, Jorge! Have you thought about updating this blog more often? For example: The blog SketchUp Wiki "http://www.suwiki.org", makes months that is "OFF Line", and you are still reading! This is a fantastic recognition of a great 3D model artist, and his community. It was absolutely wonderful to meet Jorge (and so many other 3D artists and technologists) at the Sketchup Base Camp 2010 in Boulder. He is a great guy, and a dedicated historic preservationist!